Chassell Township is a civil township of Houghton County in the U.S. state of Michigan. The population was 1,822 at the 2000 census. The township was organized on April 14, 1888, and named after John Chassell, a prominent businessman and farmer whose farmland became the site of the community of Chassell. 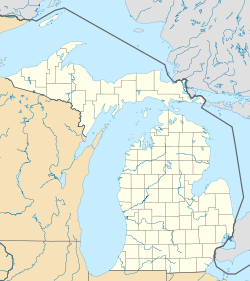 Chassell is an unincorporated community in the township located at the southwest end of Portage Lake on Pike Bay. Klingville is an unincorporated community in the township at 46°58′04″N 88°28′40″W﻿ / ﻿46.96778°N 88.47778°W﻿ / 46.96778; -88.47778﻿ (Klingville, Michigan). Portage Entry is an unincorporated community in the township located at 46°58′56″N 88°26′26″W﻿ / ﻿46.98222°N 88.44056°W﻿ / 46.98222; -88.44056﻿ (Portage Entry, Michigan) on the west side of the Portage River, roughly across from Jacobsville in Torch Lake Township. A post office operated from October 10, 1851 until August 8, 1853. Singing Sands is an unincorporated community in the township. According to the United States Census Bureau, the township has a total area of 51.9 square miles (134 km2), of which 48.7 square miles (126 km2) is land and 3.2 square miles (8.3 km2) (6.14%) is water. As of the census of 2000, there were 1,822 people, 728 households, and 505 families residing in the township. The population density was 37.4 per square mile (14.4/km²). There were 955 housing units at an average density of 19.6 per square mile (7.6/km²). The racial makeup of the township was 97.75% White, 1.48% Native American, 0.11% Asian, 0.05% Pacific Islander, 0.05% from other races, and 0.55% from two or more races. Hispanic or Latino of any race were 0.55% of the population. There were 728 households out of which 28.0% had children under the age of 18 living with them, 59.5% were married couples living together, 6.2% had a female householder with no husband present, and 30.5% were non-families. 26.8% of all households were made up of individuals and 13.3% had someone living alone who was 65 years of age or older. The average household size was 2.49 and the average family size was 3.06. In the township the population was spread out with 26.0% under the age of 18, 7.8% from 18 to 24, 23.9% from 25 to 44, 25.5% from 45 to 64, and 16.8% who were 65 years of age or older. The median age was 40 years. For every 100 females, there were 104.0 males. For every 100 females age 18 and over, there were 103.0 males. The median income for a household in the township was $38,333, and the median income for a family was $43,088. Males had a median income of $35,188 versus $25,833 for females. The per capita income for the township was $18,133. About 5.6% of families and 6.9% of the population were below the poverty line, including 7.2% of those under age 18 and 8.1% of those age 65 or over. The high school building was built in 1912 and, together with a 1917 elementary school, has been on the National Register of Historic Places since 2009 as the Chassell School Complex. In 1992, the schools were moved to Chassell Township School, which serves as a K-12 public school. ^ "Klingville, Michigan". Geographic Names Information System. United States Geological Survey. ^ "Portage Entry, Michigan". Geographic Names Information System. United States Geological Survey. ^ "Portage Entry Post Office (historical)". Geographic Names Information System. United States Geological Survey. ^ "Chassell School Complex". NPGallery Digital Asset Management System. National Park Service. Retrieved 16 June 2018. ^ "Dates in the History of Chassell, Michigan". Retrieved 16 June 2018. This page was last edited on 15 February 2019, at 03:06 (UTC).